As with the previous map, click anywhere within a state to zoom in and see the statewide totals. And if you’d rather go back to the state-level colors, there’s a toggle at the top right (note that there are a few states where county-level data is not available, and in that case we show statewide totals in both views). And don’t forget a feature we’ve had for a while: if you click a candidate’s name up top, it shows their relative strength on the map. We do understand that not every state calls them counties, please know we don’t mean to offend the parishes of Louisiana or the boroughs of Alaska. Speaking of county trivia, did you know that there are 31 different Washington Counties, or that San Bernardino County, CA is larger than the Rhode Island, Delaware, Connecticut and New Jersey combined? With so much geographic diversity in our vast nation, we hope this extra tool makes the politics of it all a little easier to sort out. Now that the Republican presidential primary race is winding down, we’ve got a new way to look back through three months of voting and caucusing. 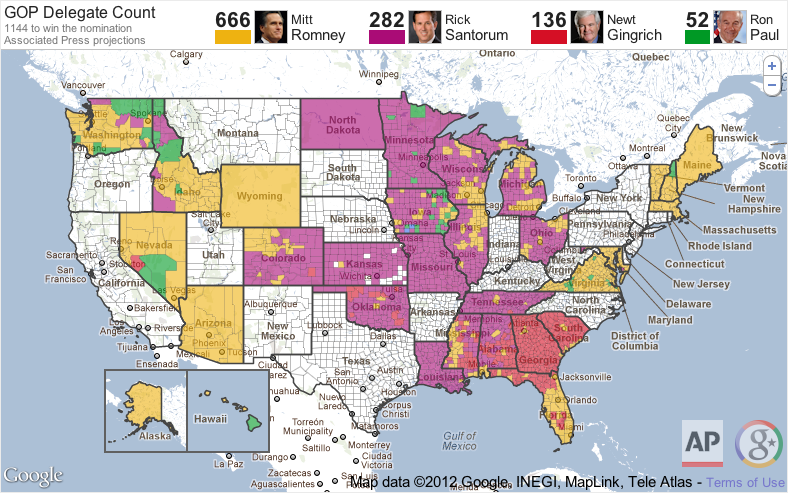 The latest version of our election results map lets you see the county-by-county results across the nation. 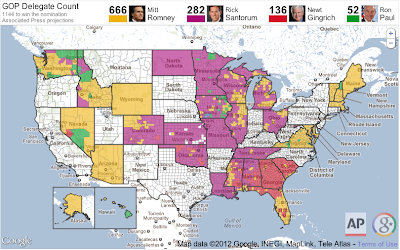 This new feature allows you to see the details of thousands of counties by seamlessly gliding your mouse over our map.